Ru then mentioned that he’s been looking into upgrading his Go Pro 4. He discussed the Sony RX100iv as well as the Canon D7 with a Nauticam Housing, and asked for any help and advice that you listeners might have. Email him at ru@surfsimply.com. Harry spoke about using his Seaglass Project Albacore, which is a finless Alaia surfboard and we spoke about Julian Wilson surfing his Catch Surf Beater as well as Derek Hind surfing finless boards at J-Bay in South Africa. First item in the news this episode was Surf Snowdonia shutting down for repairs after 3 weeks of operation, but we then went on to talk about the Red Bull Unleashed competition that will be taking place there in September. We also spoke about Sam Wakerley’s trip to Surf Snowdonia and his article for the Surf Simply Magazine which we’ll be publishing soon. Harry mentioned the Maldives government’s ruling to keep public access to two of their most famous waves. In talking about this, we referenced the Fijian governments similar ruling from a few years ago. 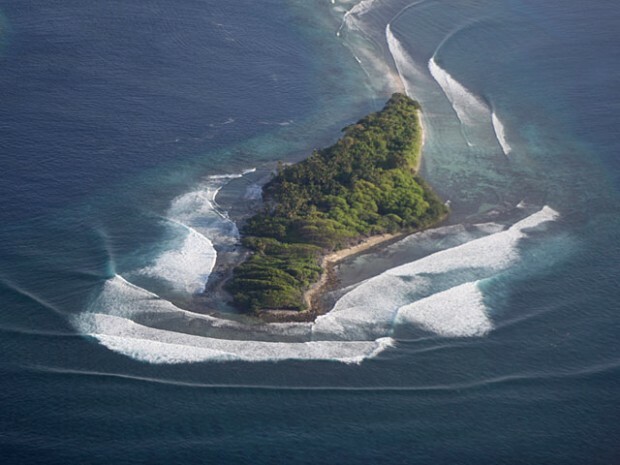 The two waves in question were Sultans and Honkies, which break on either side of the small island of Thanburudhoo, where a private resort was being planned. Ru then also mentioned the Nihiwatu Resort in Indonesia, which does have private ownership of the wave in front of it. Harry then brought up the recent coverage of the El Nino Cycle that has been gathering strength over the last few months. Surfline made a good video (which I can’t embed) of what El Nino means for us surfers, and below is the BBC explaining what El Nino is. The 7th event in the men’s world tour, the Billabong Pro Tahiti, has just wrapped up at Teahupoo. Jeremy Flores won the event, and we spoke about his accident in Indonesia last month. We also spoke about CJ Hobgood’s amazing 10 point ride, as well as Filipe Toledo’s unfortunate 0.0 heat total and the high number of injuries in this years contest. The heat between John-John and Gabriel Medina was amazing, and worth watching in full. Harry rounded up the Fantasy Surfer results. Join our group here. Next events for the Men will be the Hurley Pro and for the Women it’s the Swatch Pro. Both will take place at Trestles in Southern California from Sept 9th to 20th. 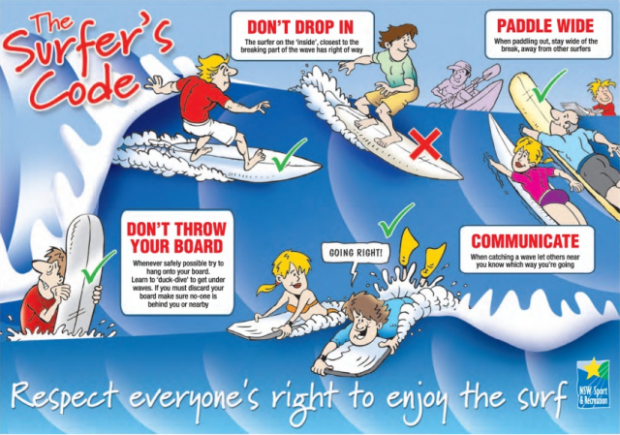 Harry opened a discussion on Surf Etiquette. He suggested that most people would be familiar with the basics, but just in case, here’s a good illustration. Harry’s suggested rules were: Don’t Crash, Observe the Line-Up, Communicate & Look After Others. 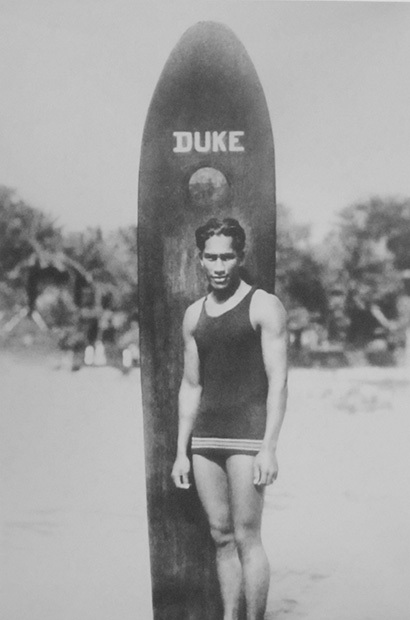 Ru spoke to us about champion surfer and swimmer, and father of modern surfing, Duke Kahanamoku, who was honoured last week when he became a Google Doodle on what would have been his 125th birthday. Ru suggested Shane Dorian’s movie, Plate Lunch as being well worth watching. Harry then mentioned Epic TV’s series called Board Stories, which you can watch HERE. Ru also brought up Kelly Slater’s interview that he gave while out in Tahiti.